Yellow is the color of caution, of warning. . .of safety. Bright yellow captures the attention, demanding respect and drawing the eye. 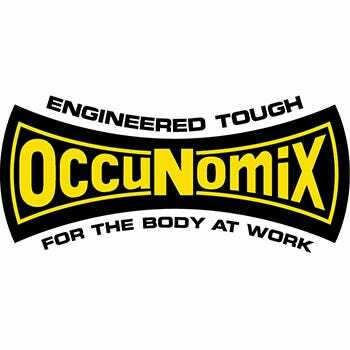 When bright yellow is pared with quality construction and safety standards, it becomes the OccuNomix OCCLUX-SWTLH Y High Visibilit ... (see full details) (see specifications) #OCCLUX-SWTLH-Y. Yellow is the color of caution, of warning. . .of safety. Bright yellow captures the attention, demanding respect and drawing the eye. When bright yellow is pared with quality construction and safety standards, it becomes the OccuNomix OCCLUX-SWTLH Y High Visibility Yellow Sweatshirt. Hoodies represent the best that clothes have to offer: cozy warmth, roomy comfort and go-anywhere style. But wear a dark grey or blue one, and you'll disappear in shadowy, dim lighting conditions. When you wrap yourself in fluorescent yellow instead, you'll stand out even against bright sunlight. High visibility means high safety; being noticed on your job site is essential. The 5.89 ounce fabric blend is a combination of soft, breathable cotton and wear-resistant polyester. The 50% cotton adds insulating softness to the 50% wrinkle-resistant, quick-drying polyester creates an easy-to-wash hoodie. Use the drawstring to cinch the hood close to your face to lock in all the insulating warmth. This sweatshirt is rated as Class 2 high-vis safety wear. One horizontal and two vertical stripes, made with 2-inch silver reflective taping, help you light up during the nighttime. There's no such thing as being too visible or too safe. To get even more noticed you can have this hoodie custom embroidered by the Working Person's store. But there is such a thing as too cold. That's why the pouch pocket doubles as a hand warmer. This OccuNomix OCCLUX-SWTLH Y High Visibility Yellow Sweatshirt is ready for work. Are you ready to be safe and warm on the job? If your answer was yes, then put this protective hoodie in your cart today. I bought a couple of these for running, thinking I was getting a legitimate sweatshirt. This sweatshirt is EXTREMELY thin. To me, it is lightweight fleece, rather than a true "sweatshirt." I'm going to have to add more layers than I had intended. Disappointed. And, the tag disclaims "25 washes max". So, I guess the reflectiveness wears out. Makes sense, but didn't realize that I was buying a one-season-disposable garment. Product is what I orderd and was delivered in timely fashion. I ordered this for work and all my co-workers decided they wanted one also. These sweatshirts are perfect for when it is not to cold and meet the standards for our work uniforms. this is a great visibility clothing item with a soft comfortable fit. Got these accepted as alternative to road warning vests (required at my facility) for motorcycles on post. Really appreciate the soft, thin comfortable fit for our high desert summer nights, along with the bright reflection tape. I dont always wear this "illuminate" the road sweatshirt, but sometimes... need the safety and am thankful for this product in that. The sweatshirt is comfortable. I was looking for a thin shirt to wear on the job that also meets the safety codes. This shirt is not bulky and not to hot. Its just right for the chilly mornings and nights. I would recommend this shirt to anyone that likes pullovers and comfort. I like the fact that you can wear it all winter. Occunomix Sweatshirts: Men's High Visibility Cotton Blend Hooded Sweatshirt OCCLUX-SWTLH Y is being added to your cart.